Glen Martin, CEO Infrastructure Energy, Sault Ste. Marie mayor Christian Provenzano, Rob Brewer, president and CEO of PUC Distributing and Sault MP Terry Sheehan. SAULT STE MARIE - PUC Distribution Inc. in Sault Ste. Marie is receiving $11.8 million from the federal government to invest in infrastructure. 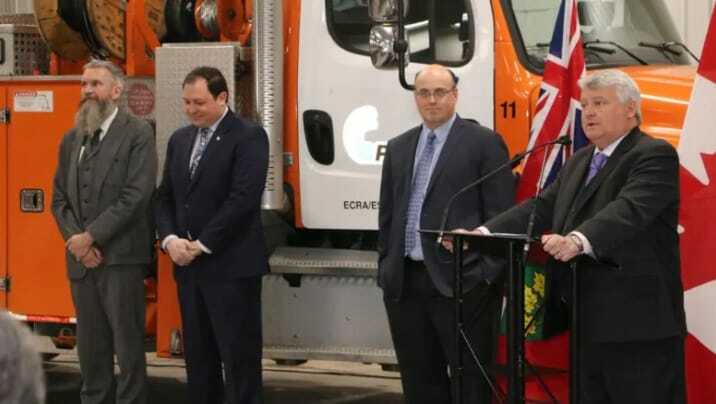 The MP for the riding, Terry Sheehan, made the announcement on Monday. The money will go to the utilities smart grid project. "This smart grid project offers a glimpse into our clean energy future and represents a new wave of economic activity for the region," Sheehan said. "Along with job creation, new industries will be attracted to a modern grid, all while helping the environment." His office says the investment will allow the utility to reduce outages, provide more information to customers to help make smarter electricity use choices and offer more services. "This is an innovative project that makes Sault Ste. Marie a leader," mayor Christian Provenzano said. "We will be the first city in our country to implement a community-wide smart grid. Once it is complete, the smart grid will make our energy infrastructure more reliable, reduce energy loss and lead to a more innovative economy for our community." The project will also create 140 new jobs. "As a community-focused utility, we are always looking for innovative ways to help our customers save money and reduce their carbon footprint," Rob Brewster, president and CEO of PUC Distribution said. "The investment the government has made in our community will not only help modernize our city's electrical distribution system [as] once the project is complete, Sault Ste. Marie will have access to an electricity grid that can handle the growing demands of a city in the 21st century."